This has been in the works for quite some time now. There was an article in the Globe back in May about the Tannery taking over the former Restoration Hardware space at 711 Boylston. But I guess things fell behind schedule because there's a new article in the Courant saying that it's not going to happen until "sometime next year." The owner of the Tannery, which carries high-end clothing, will open a store at the location the home furnishings chain vacated earlier this year. There are two Tannery shops in Harvard Square and one at 400 Boylston Street. According to the sources, the family, which also owns the two Boylston Street buildings, has long term plans to turn 400 Boylston into office space. 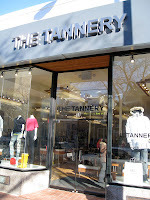 I've never been inside the Tannery before, then again I don't really wear "high-end" clothing. Any readers that shop there and want to put in their two cents? 2 Response to "711 Boylston To Become The Tannery"
I've been to the Tannery on Boylston - I don't know about 'high end clothes' but their shoe and boot selection is really great. A lot of high-quality imported brands and helpful, if stern, salespeople. Do not shop here. The owner is seriously a very obnoxious and rude man. Before you decide to go there do yourself a favor and see all the reviews on YELP that talk about their bad experiences there. There are plenty of other places to shop.